The Plot: Zoe is writing letters, letters to America, to a man on death row. She is writing him, because "I know what it's like. Mine wasn't a woman. Mine was a boy. And I killed him three months ago exactly." No one knows. So Zoe is at home, going through the motions of her life, being the daughter her parents expect, the older sister her younger sisters expect, the person her friends expect. But it's eating at her, what she did, what she didn't do, what happened three months ago. She has to tell someone. So Zoe picked someone like her. Someone who knows what it likes to have killed someone. Someone who is being punished. The Good: I have to admit, the "writing letters to a convicted killer in prison" was not the pitch that won me over. What won me over was hearing it was the winner of the 2014 Edgar Award. I love a mystery! What made me fall in love with this book was the sympathetic, tragic, and realistic triangle between Zoe and two brothers. It's the type of thing that on paper, that intellectually, you can say doesn't make sense; shouldn't happen. But Ketchup Clouds takes us, slowly, through Zoe's life, through the year, and it breaks my heart. Because it not only makes sense -- at each point, I nodded, agreeing fully with Zoe's emotions and choices. Max Morgan is popular and handsome and cool, and Zoe is smart enough and self aware enough to know that the attraction is partly being flattered, partly lust. There's a hot boy who likes her, and she likes him back. "He actually sounded nervous. Max Morgan. Nervous because of me." And it's Zoe's first boyfriend, her first relationship. And I just loved it, even forgetting every now and then that it would end in death. I also liked Zoe's family: Zoe's mother is overprotective, meaning she's not someone Zoe can confide in. Zoe's family was so fully and lovingly drawn, and complete, with it's own story. As Zoe lives with her secret, the two brothers and what happens, she learns about some family secrets and gains a better understanding of her parents' lives and choices. And how you can live, eventually, with the things you think would break you. 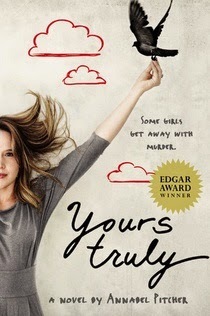 There was such a sense of sadness, and living with grief, that I'd hand this to anyone looking for If I Stay readalikes. Cover change: I love that they kept the design. 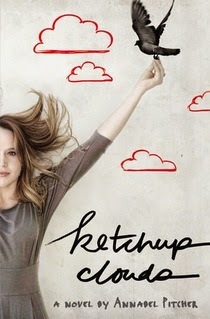 As for the title, Ketchup Clouds is one of those titles that makes perfect sense after having read the book, but I think Yours Truly with the line "some girls get away with murder," better sells the book to readers.